Interstate 680 previously circled around the outskirts of Omaha, but suburban expansion extends the city limits westward all the way to the Elkhorn River now. The freeway still provides a bypass of I-80 for long distance interests between Lincoln and Des Moines. Interstate 680 forms a belt route encircling Omaha from the Prairie Lane neighborhood to the Missouri River at Wyman Heights. The route within Nebraska is mostly suburban, with development lining the freeway frontage from Interstate 80 north to 72nd Street (Exit 9). Suburban expansion of Omaha westward along Nebraska 64 (Maple Road), the West Dodge Expressway (U.S. 6) and Center Road (former Nebraska 38) adds traffic to Interstate 680 as a commuter route. The route changes cardinal directions from north-south banners between I-80 and 72nd Street to east/west banners for the remainder of the route east into Iowa. The Iowa portion of the route consists of a rural and scenic freeway, including a nearly 10-mile overlap along Interstate 29. Crossing the Mormon Bridge over the Missouri River, the freeway traverses a flood plain east to the full cloverleaf interchange with I-29 and County Road G37 outside the city of Crescent. Interstate 29 leads I-680 north parallel to the Missouri and Boyer Rivers to Loveland, where the bypass resumes an eastward heading across the Loess Hills. A vista point resides along this otherwise lightly traveled stretch taking I-680 back to Interstate 80 near Neola. The Mormon Bridge carrying Interstate 680 traffic across the Missouri River. Photo taken March 30, 2016. 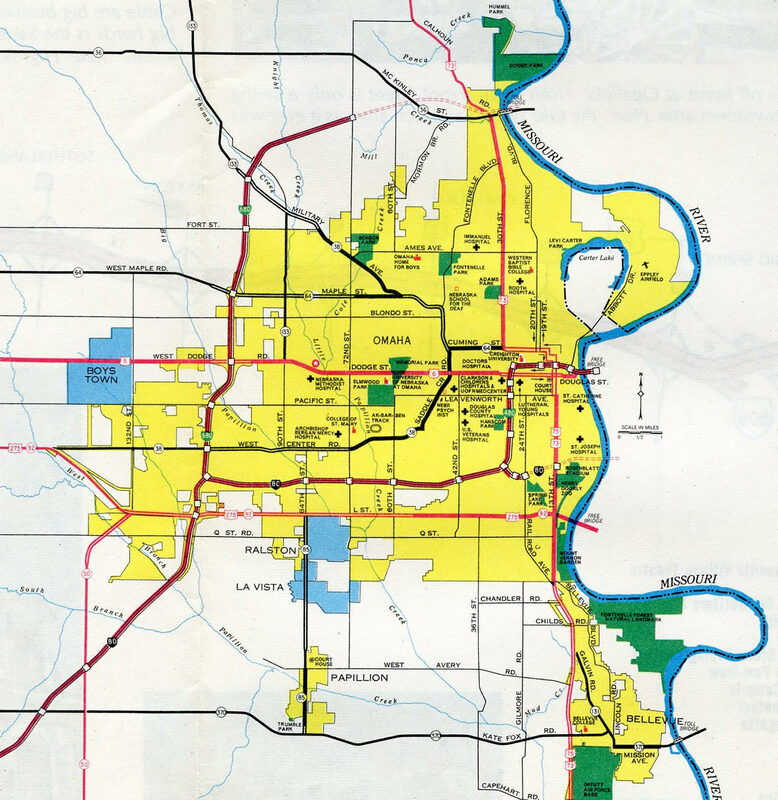 Originally, what is now Interstate 680 was planned in two parts: Interstate 280, the loop from Interstate 80 west of Omaha to I-29 north of Council Bluffs, and Interstate 80N, the independent section of I-680 east of Interstate 29 in Iowa. I-680 was initially proposed for the entire route, but AASHO changed it to I-80N on November 10, 1958.4 The I-280 designation was dropped by 1965 once it was realized that Iowa would have had two separate Interstates numbered 280: one here and the other at the Quad Cities (Moline/Bettendorf). 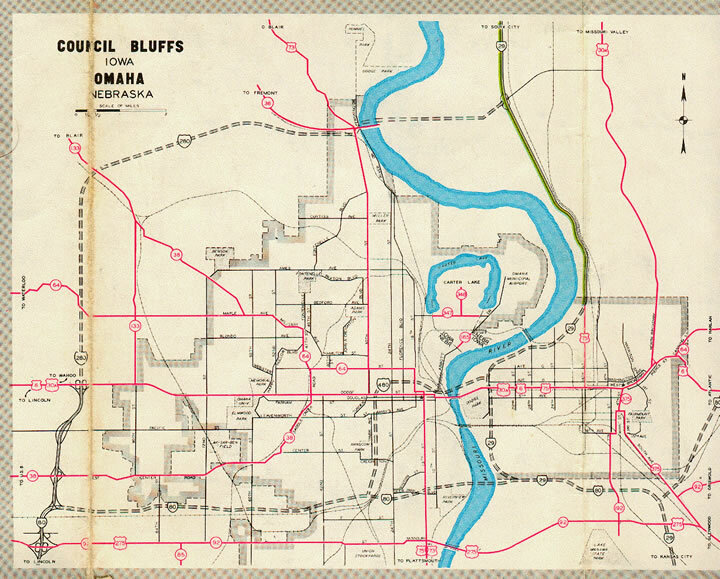 The 1961 Iowa Official State Map shows the original proposed numbering of I-680 as I-280 on the bypass around Omaha and Council Bluffs. Map scanned by Jeff Morrison, 02/03/07. 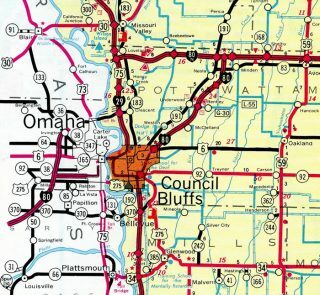 The Rand McNally North American Road Atlas showed Interstate 280 on the Omaha inset until the 1967 edition. 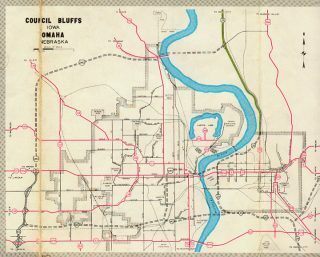 The Neola Diagonal, I-80 northeast from I-29 to I-680, was the alignment advocated by Council Bluffs and Omaha officials during the early Interstate system development. Iowa officials pushed for the route west to Loveland and I-29 to benefit Sioux City. Interstate 680 was open north to Nebraska 64 (Maple Street) by 1969 and under construction from there north to the new alignment of Nebraska 133 (Blair High Road). The first sign for Interstate 80 (Exits 29A/B) posted along I-680 east appears ahead of Neola Creek. Photo taken 06/17/15. Motorists continue just a half mile from the diamond interchange with Iowa 191 north and CR G8L south to the ramp partition (Exits 29A/B) for Interstate 80. Photo taken 06/17/15. Crossing over Mosquito Creek, the eastbound lanes of I-680 turn southward and separate. Exit 29B takes eastbound motorists 100 miles to the capital city of Des Moines. Photo taken 06/17/15. Exit 29B provides return access southwest toward Council Bluffs and Interstate 29. This movement is useful for Iowa 191 southbound traffic interests from Persia, Portsmouth, and Panama. Photo taken 06/17/15. This sign for Interstate 80 was replaced with a Clearview font based assembly by 2014. Photo taken by Jeff Royston (12/04/05). A wide view of the directional T interchange between Interstates 80 and 680. The exchange is set in a rural valley fed by Mosquito Creek. Photo taken by Jeff Royston (12/04/05). Lowering to cross and old railroad grade and Keg Creek, motorists along I-80 west see the first advance sign for Interstate 680. Photo taken 03/28/16. Interstate 80 rises on a bluff west of Exit 29 on the one mile approach to the westbound split with I-680. Interstate 680 is signed with Sioux City for the connection with Interstate 29 north. The Missouri River city is located 89 miles to the northwest. Photo taken 06/17/15. Interstate 80 veers southeast to Neola, Underwood and Council Bluffs en route to Downtown Omaha while I-680 bee lines west to Loveland and Interstate 29. The freeway comprises a rural route to north Omaha. Photo taken 06/17/15. Entering the directional T interchange with Interstate 680 on Interstate 80 east. Note the sign error where the I-80 mainline was also signed as Exit 27. Sign changes made by 2011 greened out North Omaha and replaced the exit tab for I-680 west. The exit tab on the pull through panel remained. Clearview sign panels installed by 2014 restored North Omaha while adding a LEFT exit tab for I-680. The erroneous tab to the right was also finally dropped. Photo taken by Dale Sanderson (2001). Approaching the easternmost mainline interchange of Interstate 680 along County Road G8L (Railroad Highway) north. Signs here previously referenced I-80 for the eastbound on-ramp. All stand alone shields were replaced by 2014 with small guide signs. I-680 is referenced solely with the change. Photo taken by Jeff Morrison (06/09/03). 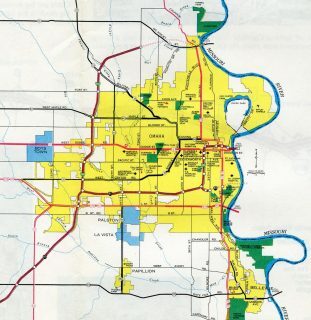 Between Jan. 1, 1969 and July 1, 2003, Iowa 191 paralleled Interstate 80’s diagonal southwest from Neola to Council Bluffs. Today it ends at Exit 28 of Interstate 680. This sign assembly previously directed motorists onto the westbound on-ramp to north Omaha and the former continuation of IA 191 south. It was replaced with an end shield by July 2005. Photo taken by Jeff Morrison (06/09/03). The replacement signage for the south end of Iowa 191 at the diamond interchange with I-680. The shield for I-80 east was replaced with a small guide sign placed further south by 2014. County Road G8L follows the old IA 191 south otherwise. Photo taken by Jeff Morrison and Jason Hancock (06/12/05). A two lane collector distributor roadway branches away from the southbound mainline at Exit 1 for West Center Road (former Nebraska 38). The c/d roadway continues south to provide access to the local lanes of I-80 west for I Street, U.S. 275 & Nebraska 92 (L Street) and Q Street. The ramp from I-680 south to I-80 west bypasses all local exits to Giles Road (Exit 442). Photo taken 03/30/16. The c/d roadways bring Interstate 680 up to 11 overall lanes as the freeway passes through the parclo interchange (Exit 1) with West Center Road (former Nebraska 38). The freeway mainline splits in one half mile for Interstate 80. Photo taken 03/29/16. The two left lanes connect to Interstate 80 east, while the two right lanes connect to Interstate 80 west (signed as Exit 446 based upon the I-80 mileage). The connection from southbound Interstate 680 to eastbound Interstate 80 is part of a commuting pattern to downtown Omaha. Photo taken 03/29/16. The Exit 1 c/d roadway partitions into a two lane ramp for I-80 west to U.S. 275 & NE 92 for Westwood Heights and Old Millard East and a single lane connection to I-80 east toward the Westgate Area and Downtown. Photo taken 03/30/16. Typical of Nebraska and Iowa signing practices, an end panel appears as Interstate 680 enters the three wye interchange with I-80. 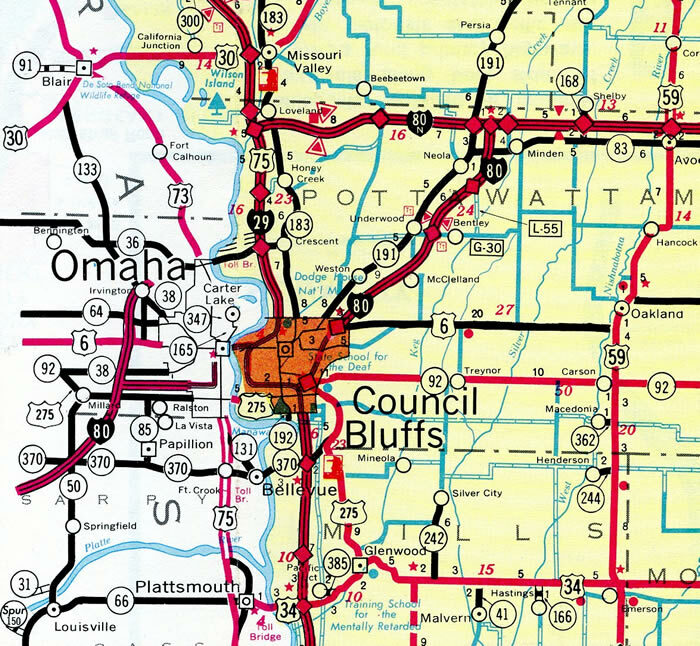 The transition to westbound Interstate 80 is part of the bypass route around Council Bluffs and central Omaha. Photo taken 03/29/16. The c/d roadway partitions for Interstates 80 east and west. Construction underway in 2015 and 2016 resulted in ramp closures as NDOR rebuilt some of the ramps between the two freeways. Photo taken 03/30/16. Replaced guide signs for I-680 south at Exit 1. The shield for Nebraska 38 was greened out, as it was decommissioned on January 1, 2003. The c/d roadway for Exit 1 continues to parallel Interstate 680 before merging onto the westbound I-80 c/d roadway that connects to U.S. 275 & Nebraska 92 and the alphabet streets. So in essence, Exit 1 also provides a connection to Interstate 80, while the main lanes are the direct bypass route. Photo taken 09/05/05. Separate panels for Interstate 80 east and Exit 446 for I-80 west were replaced with a diagrammatic sign by 2007. Photo taken 09/05/05. 11 lanes of traffic run between Exit 1 with West Center Road and Interstate 80 (Exit 446). Signs here were also replaced with a single diagrammatic sign by 2007. Photo taken 09/05/05. Crossing the Douglas County line and West Papillion Creek, Interstate 80 turns northward on the two mile approach to Exit 446 with Interstate 680. Photo taken 06/18/15. A two-lane collector distributor roadway (Exit 445) splits from the Interstate 80 eastbound mainline at the Q Street overpass. The roadway serves the adjacent cloverleaf interchange with U.S. 275 & Nebraska 92 (L Street) while the mainline continues one mile to Exit 446 with the I-680 north. Photo taken 06/18/15. Advancing north from U.S. 275 & Nebraska 92 (L Street), Interstate 80 enters the three wye interchange (Exit 446) with Interstate 680. The adjacent c/d roadway remains separate from the I-80 mainline until after the exchange with I-680. Photo taken 06/18/15. Passing under I Street, both the Interstate 80 mainline and Exit 445 c/d roadway approach their respective ramps for I-680. Interstate 680 encircles Omaha to Florence. Photo taken 06/18/15. Interstate 80 resumes an eastward course from Exit 446 to the Westgate Area, Robin Hill and Hanscom Park toward Downtown Omaha. Photo taken 06/18/15. A slip ramp joins the Exit 445 c/d roadway with the flyover taking motorists from Interstate 80 east to Interstate 680 north. Photo taken 06/18/15. Interstate 80 east at the Exit 445 c/d roadway for U.S. 275 & Nebraska 92 (L Street). I-80 was only four lanes wide at this time. Photo taken by Nick Wiltgen (05/01). Widening of Interstate 80 to six lanes included sign changes at the L Street overpass. A lane drop now occurs at Exit 446. Photo taken by Nick Wiltgen (05/01). Replaced guide signs and removed light fixtures as the split of I-80 east and I-680 north. No control city is used for Interstate 680 in Omaha. Photo taken by Dale Sanderson (2001). Interstate 80 west leaves the Westgate Area on the two mile approach to Exit 446 with Interstate 680 north. Photo taken 06/18/15. Five lanes of Interstate 80 west advance toward the three wye interchange (Exit 446) with Interstate 680 north. A collector distributor roadway (Exit 445) departs prior to the mainline I-680 off-ramp (Exit 446) for the subsequent three exits of I-80 west to I Street, U.S. 275 & NE 92 (L Street) and Q Street). Photo taken 06/18/15. South 96th Street spans Interstate 80 west a half mile ahead of the separation with the Exit 445 c/d roadway. Exit 445 also connects with the local lanes of I-680 north to the adjacent West Center Road (former Nebraska 38) interchange (Exit 1). Photo taken 06/18/15. Interstate 680 travels north to serve as the western and northern bypass of Omaha. 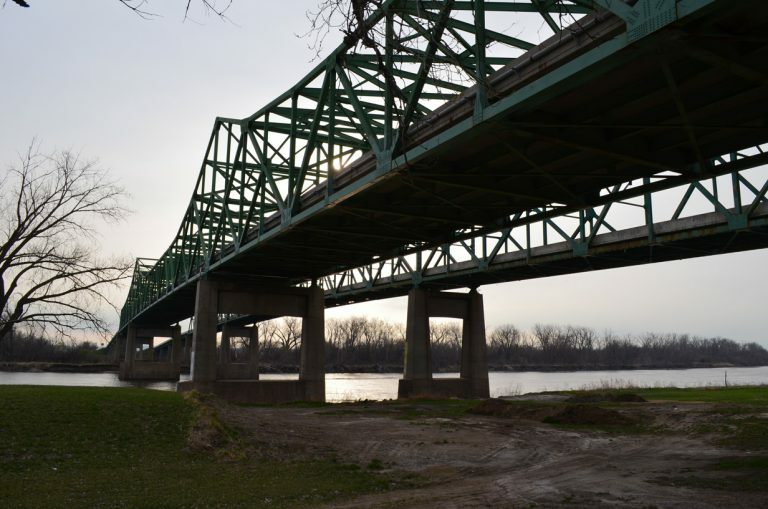 However, it is also a conduit for the growing western suburbs in conjunction with the booming corridor along U.S. 6 and the West Dodge Expressway. Photo taken 06/18/15. Two lanes partition from I-80 west for the c/d roadways running north to West Center Road and southwest to I-L-Q Streets. The additional roadways along both I-80 and I-680 were added during construction from spring 1994 to December 1997 to better separate local and through traffic movements. Photo taken 06/18/15. Three lanes follow onto the Interstate 680 mainline (Exit 446), which bypasses West Center Road (old Nebraska 38) to Pacific Street and the West Dodge Expressway (U.S. 6) leading to Elkhorn and Fremont. Photo taken 06/18/15. “Mormon Bridge Opens.” Eugine Register-Guard (Eugene, OR), December 14, 1952. Mormon Pioneer Memorial Bridge, Johnweeks.com. “President Kimball speaks at rites ending tolls on Mormon Bridge.” The Deseret News (Salt Lake City, UT), April 28, 1979. 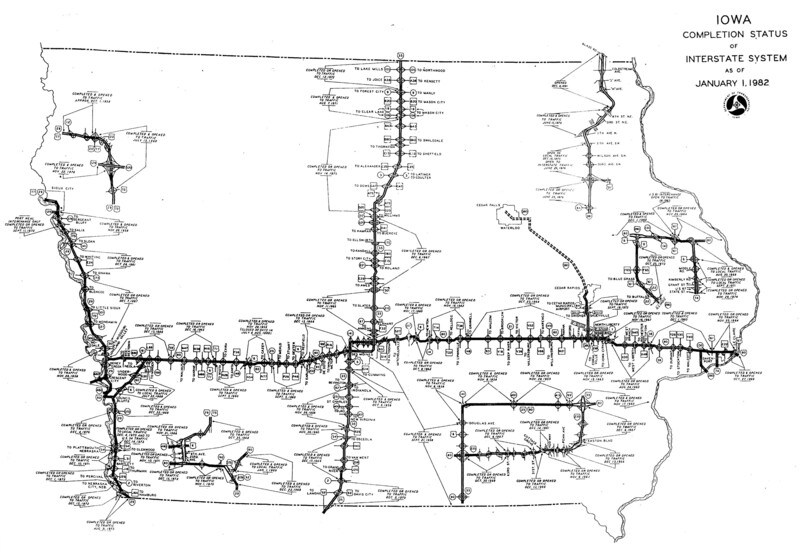 Stephen Summers’s Interstate system route numbering page. “‘Mormon Trail Interstate’ Opens in Nebraska.” The Deseret News (Salt Lake City, UT), August 31, 1974. “Rebuilding of I-80: End Is in Sight Final Work Going to Bid Soon Interstate Construction.” Omaha World-Herald (NE), July 14, 1997. “New Lanes May Unclog Rush Hour.” Omaha World-Herald (NE), November 22, 1997. “Interstate Rebuilding Is 99% Complete.” Omaha World-Herald (NE), December 14, 1999. “Interstate 680 Iowa/Nebraska Additions and Edits.” personal email from John 2889 at MSN dot com, 12/10/03. “A smoother ride at I-680-West Dodge.” Omaha World-Herald (NE), June 11, 2005. “I-680 widening nears the finish line.” Omaha World-Herald (NE), October 11, 2005. “Project unties the traffic knot – Expressway’s major work done earlier than expected – Smooth flow for construction.” Omaha World-Herald (NE), July 20, 2007. “Bridge’s reopening will please businesses – The Pacific Street bridge over I-680, closed since May for road work, may reopen as early as Saturday.” Omaha World-Herald (NE), August 22, 2008. “Happy holidays for I-680 rebuilders? – Two contractors chosen for the job have until Dec. 23 to open the road, with big bonuses for getting done earlier.” Omaha World-Herald (NE), September 27, 2011. “Early reopening of I-680 ends flood-forced detours.” Omaha World-Herald (NE), November 3, 2011. Page updated April 7, 2016.